Two months ago, Topeka Capital Markets analyst Brian White gained significant attention for his claims that Apple is targeting a late 2013 launch for its long-rumored television set. In his research note, White claimed that Apple has been working on a 60-inch television that will use an "iRing" motion controller as well as iPad-like auxiliary second screens. In a new research note published today, White stands by his previous claims, continuing to believe that Apple is looking to service subsidies to help bring the upfront cost of the television set down. We were told that carriers will be an important part of the go-to-market strategy for Apple's TV ambitions and subsidize the $1,500-$2,500 "iTV", offering customers a single bill that will include a wireless plan (i.e., iPhone, iPad), Internet connection services, an "iTV" plan and other services. As we have previously discussed, the 60-inch "iTV" (50-inch and 55-inch may also be available) is anticipated to come with one iPad-sized "mini iTV" with the option to add more "mini iTVs". Such bundling may, however, be difficult given that customers frequently have different wireless carriers and cable or satellite television providers, although some providers such as Time Warner Cable and Verizon Wireless have teamed up to offer bundles of TV, Internet, home phone, and mobile phone service. Motion detection technology will be used on the "mothership iTV" and the "iRing" will allow for improved control accuracy. For example, we believe the "iRing" will provide for more accurate control of channel surfing, content management and settings via motion detection, while also offering a more seamless gaming experience on Game Center. We were told that "iRing" will not be the sole option available to control the "mothership iTV", as iOS devices (i.e., iPhone, iPad) and Siri will provide alternatives for similar or different use cases. Clearly, there will be many different uses for "iTV" and similar to the various devices (i.e., remote, Magic Mouse, Magic Trackpad, wireless keyboard, etc.) that are used to control an iMac, we believe it makes sense for consumers to have different options to control the "iTV". Finally, White believes that component production for Apple's rumored lower-cost iPhone will ramp up this month, setting the stage for a possible introduction as soon as next month. Most sources have, however, indicated that it will launch somewhat later, with KGI Securities analyst Ming-Chi Kuo indicating that a launch in the August-October timeframe is most likely due to Apple's continued work on color coatings for the device's plastic shell. This iRing business sounds like such a bad idea. It needs to die, quickly. "Honey, want to rent a movie tonight?" "Yeah, I'll get the ring." "Guess what? I'm already wearing it!" Well, the analyst knows where to stick his thoughts. Will I need to put on a ring whenever I want to use the TV? Because that will be annoying... If it's only optional, then most people will only "put it on when they need it", but then never actually put on. People can't even put on condoms, even when their health depends on it. I don't see them reaching for a ring to change the stupid channel. Subsidised iTV would mean an expensive monthly contract. For what? Can't see the mobile phone or cable companies going for that solution. If they can't build it for a reasonable price then don't bother and stick with the current AppleTV box. Anyone else have a sense of dread and embarrassment about this iTV impending colossal failure?! Nah. It'll be great. I'm really looking forward to putting my finger in Tim's ring. - CEC support. 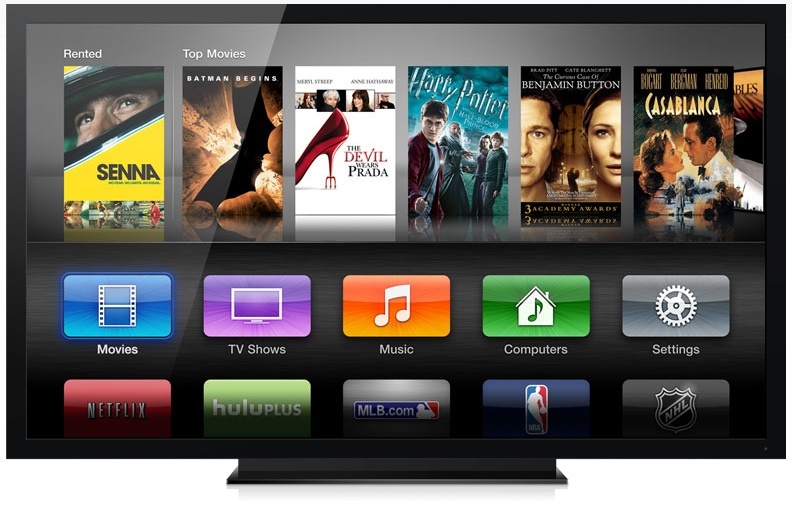 The Apple TV should be able to wake up the television. Its not very convenient to start the current Apple TV with its remote or the iPhone just to see that the TV remote is not on the couch and you have to get up again. - 3rd party apps. Would open a whole new world of games and big screen content. - Cheaper TV-Series. They are way to expensive at the moment. - Direct support for iTunes libraries sitting on an external hard drive without the need to boot your Mac and start iTunes. Couldn't call it that in the UK. ITV is one of the major broadcasters. Sure they could.... The IOS name is a trademarked by Cisco, Apple came to an agreement with Cisco to use it, for a nice tidy sum I'm sure. ITV is the name of the TV company, not one of it's products. Could you imagine the reaction if Apple tried to call it the CBS TV or Fox TV? Do you think they would license their name "for a nice tidy sum"? This is the closest thing to an Apple April Fools Day joke I have ever read that is apparently not actually an Apple April Fools Day joke.